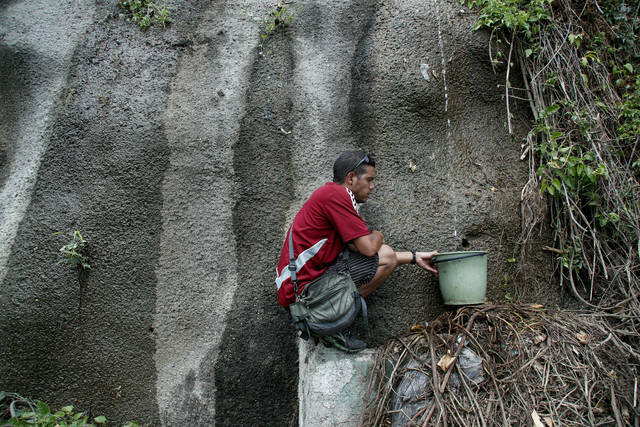 CARACAS, Venezuela (AP) — Venezuelans reached new levels of desperation Sunday as the country’s worst blackouts took their toll, gathering in larger numbers than usual at springs in the mountains of Caracas to collect water and scrounging for scarce cash to pay for food in the few shops that were open. Engineers restored power in some places after electricity and communications shut down nationwide Thursday evening, but outages persisted in many areas where people are already beset by hyperinflation as well as shortages of food and medicine. Witnesses reported overnight protests and confrontations with police in a few Caracas neighborhoods and the remains of makeshift barricades and burned debris were seen at some intersections. People are often seen at mountain springs because they don’t have running water at home and bottled water is too expensive, but hundreds crowded collection points Sunday. Some were there for the first time because water pumps weren’t working without power. Long lines of cars waited at the small number of gasoline stations with electricity. Some Venezuelan hospitals were caring for their most critically ill patients with the help of generators, but many operated without power, raising concerns about vulnerable patients who rely on oxygen concentrators, dialysis machines and other equipment. 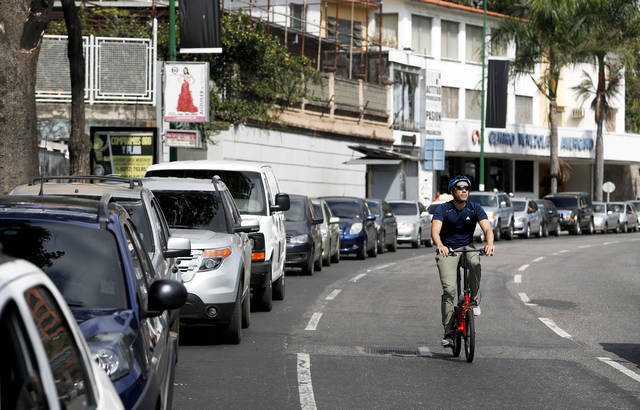 The blackout has intensified the toxic political climate, with opposition leader Juan Guaido blaming alleged government corruption and mismanagement and President Nicolas Maduro accusing his U.S.-backed adversary of sabotaging the national grid. 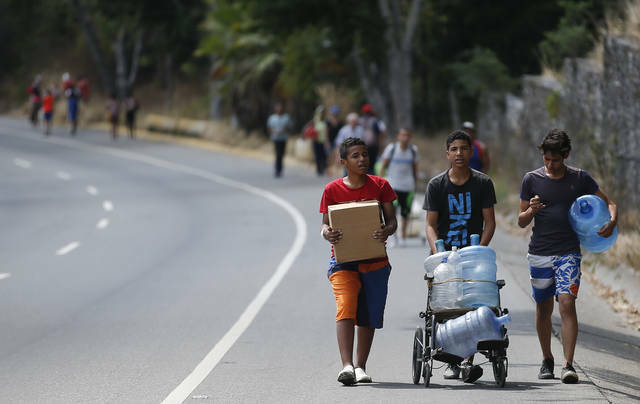 Maduro on Sunday tweeted that he had taken steps to ensure the distribution of basic necessities, including food and water, to hospitals and other places. He also posted a video that showed him with a two-way radio, purportedly talking to military commanders and governors. He said the “macabre strategy” to make Venezuelans desperate and turn them against each other would fail. Information Minister Jorge Rodriguez said schools and public offices and industries would be closed Monday as the government works to revive the grid, but did not provide an update on progress. Defense Minister Vladimir Padrino Lopez said the military deployed to protect Venezuela’s power installations from alleged saboteurs. “We know who’s behind all this,” Padrino Lopez said, echoing the government line that the U.S. staged cyberattacks on Venezuela’s infrastructure. U.S. officials have dismissed the allegation as absurd. Guaido, leader of the opposition-controlled National Assembly, said the government was covering up the impact of power cuts on the sick, making it hard to get accurate information. He cited reports that the deaths of 17 hospital patients, 15 of them in the city of Maturin, were linked to the outage, but did not provide details. Dr. Julio Castro, a doctor who supports Guaido, also referred to the 15 alleged deaths in Maturin. Health Minister Carlos Alvarado did not mention the reported deaths in comments on state television. However, he said more than 90 percent of generators that were part of a government contingency plan successfully provided power to Venezuelan hospitals, ensuring there were no major problems for seriously ill patients. Independent confirmation of the alleged deaths was not immediately available. Venezuela’s opposing factions have continually sought to discredit each other as they seek an edge in a bitter contest for power being closely watched by much of the world. The United States and about 50 other nations support Guaido’s claim that he is the interim president and that Maduro should resign so elections can be held and the more than 3 million Venezuelans who have fled their troubled country can start to return. Maduro, who counts Russia and Cuba as allies, says Guaido is a collaborator in a U.S. coup plot. Alexis Reynoso said he left his home in the Venezuelan capital Sunday morning to try to buy water and food, but most shops were closed. He said those that were open only accepted cash, but he didn’t have enough because the bank only allows small withdrawals and debit card payments aren’t possible because of the outage. With the bolivar, the local currency, in short supply, some people started to dip into stashes of dollars. University student Juan Gutierrez said Sunday lunch for his family cost $20, a small fortune in a country where the monthly minimum wage that most people earn amounts to less than $6. “You have to pay in dollars and it’s so expensive for us,” Gutierrez said. Associated Press writer Jorge Rueda contributed to this report. Disclosure statement: Davide Valeriani receives funding from DoD (W911NF1810434) and has received funding from the UK Defence Science and Technology Laboratory (DSTL) through its National PhD Programme, and the Engineering and Physical Research Council (EPSRC) under the Multidisciplinary University Research Initiative (EP/P009204/1). Disclosure statement: Princeton University Press provides funding as a member of The Conversation US. As early as Homer, more than 2,500 years ago, Greek mythology explored the idea of automatons and self-moving devices. By the third century B.C., engineers in Hellenistic Alexandria, in Egypt, were building real mechanical robots and machines. And such science fictions and historical technologies were not unique to Greco-Roman culture. In my recent book “Gods and Robots,” I explain that many ancient societies imagined and constructed automatons. Chinese chronicles tell of emperors fooled by realistic androids and describe artificial servants crafted in the second century by the female inventor Huang Yueying. Techno-marvels, such as flying war chariots and animated beings, also appear in Hindu epics. One of the most intriguing stories from India tells how robots once guarded Buddha’s relics. As fanciful as it might sound to modern ears, this tale has a strong basis in links between ancient Greece and ancient India. The story is set in the time of kings Ajatasatru and Asoka. Ajatasatru, who reigned from 492 to 460 B.C., was recognized for commissioning new military inventions, such as powerful catapults and a mechanized war chariot with whirling blades. When Buddha died, Ajatasatru was entrusted with defending his precious remains. The king hid them in an underground chamber near his capital, Pataliputta (now Patna) in northeastern India. Traditionally, statues of giant warriors stood on guard near treasures. But in the legend, Ajatasatru’s guards were extraordinary: They were robots. In India, automatons or mechanical beings that could move on their own were called “bhuta vahana yanta,” or “spirit movement machines” in Pali and Sanskrit. According to the story, it was foretold that Ajatasatru’s robots would remain on duty until a future king would distribute Buddha’s relics throughout the realm. Hindu and Buddhist texts describe the automaton warriors whirling like the wind, slashing intruders with swords, recalling Ajatasatru’s war chariots with spinning blades. In some versions the robots are driven by a water wheel or made by Visvakarman, the Hindu engineer god. But the most striking version came by a tangled route to the “Lokapannatti” of Burma – Pali translations of older, lost Sanskrit texts, only known from Chinese translations, each drawing on earlier oral traditions. In this tale, many “yantakara,” robot makers, lived in the Western land of the “Yavanas,” Greek-speakers, in “Roma-visaya,” the Indian name for the Greco-Roman culture of the Mediterranean world. The Yavanas’ secret technology of robots was closely guarded. The robots of Roma-visaya carried out trade and farming and captured and executed criminals. Robot makers were forbidden to leave or reveal their secrets – if they did, robotic assassins pursued and killed them. Rumors of the fabulous robots reached India, inspiring a young artisan of Pataliputta, Ajatasatru’s capital, who wished to learn how to make automatons. In the legend, the young man of Pataliputta finds himself reincarnated in the heart of Roma-visaya. He marries the daughter of the master robot maker and learns his craft. One day he steals plans for making robots, and hatches a plot to get them back to India. Certain of being slain by killer robots before he could make the trip himself, he slits open his thigh, inserts the drawings under his skin and sews himself back up. Then he tells his son to make sure his body makes it back to Pataliputta, and starts the journey. He’s caught and killed, but his son recovers his body and brings it to Pataliputta. Once back in India, the son retrieves the plans from his father’s body, and follows their instructions to build the automated soldiers for King Ajatasatru to protect Buddha’s relics in the underground chamber. Well hidden and expertly guarded, the relics – and robots – fell into obscurity. Two centuries after Ajatasatru, Asoka ruled the powerful Mauryan Empire in Pataliputta, 273-232 B.C. Asoka constructed many stupas to enshrine Buddha’s relics across his vast kingdom. According to the legend, Asoka had heard the legend of the hidden relics and searched until he discovered the underground chamber guarded by the fierce android warriors. Violent battles raged between Asoka and the robots. In one version, the god Visvakarman helped Asoka to defeat them by shooting arrows into the bolts that held the spinning constructions together; in another tale, the old engineer’s son explained how to disable and control the robots. At any rate, Asoka ended up commanding the army of automatons himself. Is this legend simply fantasy? Or could the tale have coalesced around early cultural exchanges between East and West? The story clearly connects the mechanical beings defending Buddha’s relics to automatons of Roma-visaya, the Greek-influenced West. How ancient is the tale? Most scholars assume it arose in medieval Islamic and European times. But I think the story could be much older. The historical setting points to technological exchange between Mauryan and Hellenistic cultures. Contact between India and Greece began in the fifth century B.C., a time when Ajatasatru’s engineers created novel war machines. Greco-Buddhist cultural exchange intensified after Alexander the Great’s campaigns in northern India. In 300 B.C., two Greek ambassadors, Megasthenes and Deimachus, resided in Pataliputta, which boasted Greek-influenced art and architecture and was the home of the legendary artisan who obtained plans for robots in Roma-visaya. Grand pillars erected by Asoka are inscribed in ancient Greek and name Hellenistic kings, demonstrating Asoka’s relationship with the West. Historians know that Asoka corresponded with Hellenistic rulers, including Ptolemy II Philadelphus in Alexandria, whose spectacular procession in 279 B.C. famously displayed complex animated statues and automated devices. Historians report that Asoka sent envoys to Alexandria, and Ptolemy II sent ambassadors to Asoka in Pataliputta. It was customary for diplomats to present splendid gifts to show off cultural achievements. Did they bring plans or miniature models of automatons and other mechanical devices? I cannot hope to pinpoint the original date of the legend, but it is plausible that the idea of robots guarding Buddha’s relics melds both real and imagined engineering feats from the time of Ajatasatru and Asoka. This striking legend is proof that the concepts of building automatons were widespread in antiquity and reveals the universal and timeless link between imagination and science. Adrienne Mayor is the author of: Gods and Robots: Myths, Machines, and Ancient Dreams of Technology. Princeton University Press provides funding as a member of The Conversation US.